Say Goodbye to bulky, over-sized CCD's- and hello the FLI MicroLine, a new, slim, affordable CCD Camera that may be smaller and lighter than its competition- but is more than capable of measuring up to and in some key fields exceeding its larger brethren! Noise, frame quality, download speeds, bit-depth, and CCD cooling- all of these are fields in which the FLI MicroLine outperforms most of it's competition. Indeed- FLI MicroLine CCD Camera's feature high speed fast download speeds that simply leave the competition behind. To support the performance of the FLI MicroLine CCD Camera, each and every component is is designed and manufactured for a long life in the most demanding conditions. All major components are CNC machined and you're looking at only the highest quality electrical components and circuit boards with logo, serial number and focal plane indicators laser-etched on the surface - not printed. FLI designed photo-etched stainless-steel shutters are field-serviceable should they ever encounter damage and the sensor is hermetically sealed from dust and moisture. But what really sets the FLI MicroLine apart, is its small scale- At 3.7 x 3.7 x 5 inches (HWL), the FLI MicroLine is a small camera with big camera capabilities! The MicroLine improves upon the highly successful FLI MaxCam design in a number of key areas including cooling, download speeds, clear aperture, and sensor capability. Another facet of this marvelously effective piece of equipment that is worth note and discussion, is its cooling system. 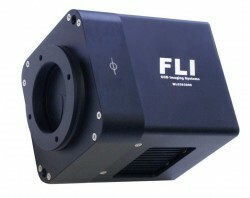 The FLI MicroLine CCD Camera's robust cooling system is capable of achieving a sustainable cooling performance of 50 to 55-degrees C below ambient. The camera's CCD can be operated at Neg.30-degrees C with typical room temperatures and without the need for water cooling or special cooling sequences. All you have to do is set the MicroLine cooling where you want it and the camera will do the rest - quickly and without any reason to worry! Now, another difference can be found in how it takes data from the Camera, to your computer. Conventional imaging cameras move the image data directly from the image sensor to the USB port, making them susceptible to added artifacts due to PC processing tasks, processor speed, and other PC-related issues. The internal frame buffer of the FLI MicroLine CCD Camera bypasses this problem by allowing an image to be quickly read out and downloaded to the PC. This allows the PC to take the image at whatever speed it is capable of without introducing any artifacts to the image. All in all, this is a stellar CCD Camera for it's size. With the FLI MicroLine, you get system compatibility and mounting options as well as mechanical shutter, liquid cooling, and Anti-Dew Technology options that will help you trick out your camera the way you want it. After all, the MicroLine line of CCD cameras is compatible with all FLI imaging accessories, including the Precision line of Color Filter Wheels and Digital Focusers! Adapters are even available for microscope, telescope and machine vision connectivity.